Sibley Field was one of the bigger challenges the park board faced when it came to building neighborhood recreation parks. 1923 was a very busy year as the park board developed Sibley Field, Chicago Avenue (Phelps) Field and Nicollet (MLK) Field in south Minneapolis, Folwell Field and Sumner Field in north Minneapolis and Linden Hills Field in southwest. But Sibley may have been the biggest challenge, because all four corners of the park were at different grades. Park superintendent Theodore Wirth wrote afterwards that Sibley was one of the only projects for which costs had been seriously underestimated due to the expense of moving dirt. 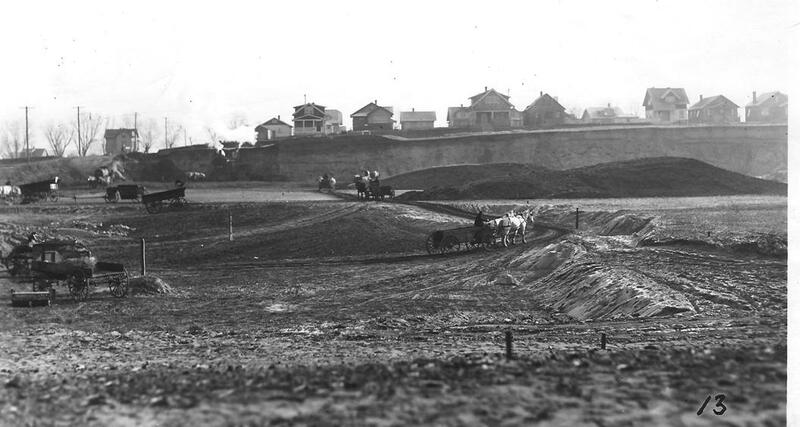 To create level fields, park board crews used a steam shovel and horse teams to move 68,000 cubic yards of earth. This is one of my favorite photos of neighborhood park construction. It shows dramatically how much earth had to be moved to create an expanse of level ground suitable for playing fields. I wonder if the home owners who sat near the precipice on 20th Avenue South were ever worried. As I noted in my profile of Sibley Field on the park board’s website, Wirth wrote in the park board’s 1923 annual report that the “formerly unsightly low land” was brought to an “attractive and serviceable” grade. Photos like this reinforce my admiration for all the people — from neighborhood residents to city leaders — who envisioned, supported, planned and paid for the parks that have made life in Minneapolis better for many generations. David, Do you know any history of Emily S. Loring, Charles Loring’s first wife? I am related through family in Portland, ME and would like to know more about her. My son, who is a Chief Ranger in the National Park Service is also very interested. Thanks very much. Thanks for your question, Judith. I don’t know a lot about Emily Loring — but I’ll dig up what I have and look up a few more things and post it soon. I would be delighted to know more about her, too, and would be happy to post anything you already know. She suffered some great family tragedies, but there is not much of a written record of her personally here. She shows up in society pages occasionally as she and Charles were among the leaders in Minneapolis. As you may know, most of Minneapolis’s leaders were from Maine. The most influential group in the young city was probably the Sons of Maine. More soon.